This year on Halloween, I thought we could talk about the scariest thing that could happen to any company trying to make themselves present online – bad SEO tactics to avoid. SEO makes such a huge difference to the impact that your website makes online, and can really affect how potential customers find you, so you should try and make sure that you and your SEO team are always following SEO tactics that are beneficial for your website in a positive way. 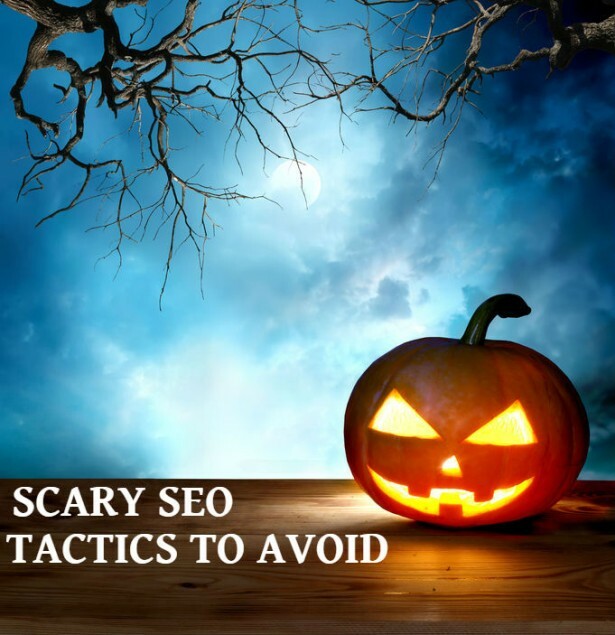 So, to help you avoid any spooky outcomes from your SEO, here is a list of bad SEO tactics that you should always avoid using. Duplicate content is probably one of the worst really. Nothing disagrees with Google more than when your site is filled with the same content over and over – and it’s also not very appealing for a customer to read. It looks uninspired and lazy, and that isn’t the impression you want to give to anyone looking at your website. If you absolutely have to have duplicate content on your website either for your users benefit, or because of your businesses nature, you should make sure that you ‘no index and no follow’ these pages so that they won’t have an effect on your SEO. Google actively punishes websites that have too many ads above the parts of your page that are visible before you scroll – which is above the fold – so you might find that you could be affected by this page layout algorithm and are suffering a loss in traffic thanks to this. You should make sure that any ads you have on your page are spread evenly, with more below the fold than above to make sure that Google won’t be displeased with your layout. If you have content on your website that is repeating the keyword that you have chosen to emphasise, you should definitely be careful not to use the keyword too much. Obviously if your keyword is used in relevant ways that are relating to what you are writing about then you won’t be punished, but if it comes across that the keyword is being repeated in ways that aren’t making sense in relation to your subject matter then this is bad SEO. Not only does this show search engines that you are purposely stuffing your work with the keyword to gain rankings, it will also put readers off from visiting your website if your content doesn’t make any real sense. There is nothing wrong with guest posting, and it can be a really useful way of creating links between yours and other websites pages, but if you are blatantly doing this just for links then you aren’t going to get a natural ranking. If the guest posts that you have on your website are genuinely good submissions and relate to your niche and engage the people visiting your website, then of course they are useful. But if you are creating guest posts solely for the purpose of getting links and aren’t necessarily working with companies/writers that relate to your website then you will not only get a bad reception from those reading, but you will also damage your ranking. Relating to guest posts, you may find that some SEO companies suggest creating relationships with other websites that will allow you to pay these websites for links to yours. Not only is this bad practice, as obviously you aren’t creating natural links, and therefore aren’t creating meaningful relationships with those posting the work and those reading it, but it is also definitely frowned upon by Google and can damage your rankings when they find out. As well as making sure that the incoming links you have for your website are from a reputable source, you should also try to make sure that there aren’t too many outgoing links leading from your website. Any websites that have a lot of outgoing links that aren’t using ‘nofollow’ tags can be seen as link farms, which can seriously damage your ranking. Google created their Webmaster tools, now called Search Console, so that they could make a better form of communication with webmasters, so there is a lot of information available for you to find about your website, as well as plenty of tools that can help you to improve your SEO and rankings with Google. If you ignore these tools, you could be seriously lacking in the chances that your website has in developing great rankings with SEO. By avoiding all of these bad SEO tactics, you can easily make sure that your website is ranking high with Google. As long as you are working with an SEO expert that doesn’t use these kinds of SEO tactic, your website should be maintained at a high ranking with all of your organic links.